A reference to things that we should use less. 1. The right to use and enjoy the profits and advantages of something belonging to another as long as the property is not damaged or altered in any way. 2. The right of using and enjoying the profits of an estate or other thing belonging to another, without impairing the substance. 3. A legal term describing a situation wherein a person or company has a temporary right to use and derive income from someone else's property (provided that it isn't damaged). 1. Someone who is entitled by usufruct to the use of another person's property. 2. Of or relating to the nature of a usufruct. 3. Someone who holds property by usufruct. 1. 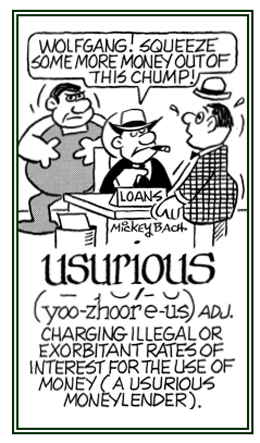 Someone who lends money at excessive rates or interest; especially, at an exorbitant or unlawfully high rate: Since Max was in desperate need for money, he went to a usurer for a fast loan and he didn't realize that the guy was a loan shark who charged very high prices for such monetary uses. 2. 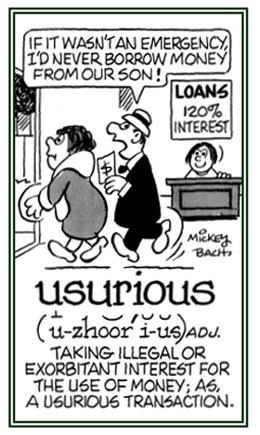 Etymology: borrowed in 1300 from Anglo-French ususrer; a variation of Old French usurier; from Late Latin usurarius, "moneylender; from Latin usurarius, "that which pays interest, for use"; from usura, "use"; from the stem uti, "to use". A reference to loan sharks who charge illegal or excessive amounts of money to customers: Henry's cousin was a usurious moneylender in the neighborhood who made sure that he got twice the amount of money back that was borrowed from him. There was a business in a certain part of town that charged large usurious rates of interest even for very small loans.